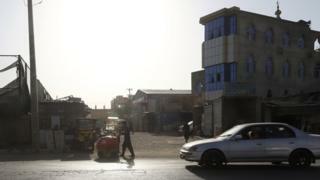 Three foreign nationals have been kidnapped and murdered in the Afghan capital Kabul, officials say. The three were from India, Malaysia and Macedonia and worked for French services giant Sodexo. Police are treating it as a terrorist incident. Investigators told the BBC the trio were taken from their car on their way to the airport. Their bodies were found in Kabul's Mussahi district. No group has so far said it carried out the killings. Sodexo has confirmed their identities and said it was "saddened and shocked" to learn of the killings. The Malaysian national is said to be 64, the Indian 39, and the Macedonian 37. Kidnapping by militants or criminals gangs seeking a ransom has been rife in Afghanistan in recent years. Locals are most often the targets, but foreigners have also been seized. Two professors, an Australian and an American, were abducted in August 2016 while working for the American University of Afghanistan in Kabul. In January 2017 they appeared in a Taliban hostage video, appealing to then president-elect Donald Trump to offer a prisoner swap for their release. The Taliban is Afghanistan's biggest Islamist militant group. However, the jihadists of Islamic State have also launched bloody attacks in urban centres.